Rolfing Structural Integration is a process of soft tissue manipulation designed to balance your body by releasing tension and strain. 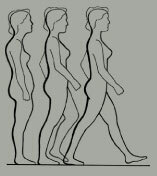 Rolfing moves beyond symptomatic relief, focusing on whole body alignment for sustainable change. Yoga is an amazing complement to the Rolfing process. Through private sessions or in a classroom setting, Yoga is a way to maintain and improve the alignment process the Rolfing work begins. "The most exciting part of my job is when our clients realize becoming pain-free was just the first step on a larger journey towards feeling more relaxed, energized and resilient."